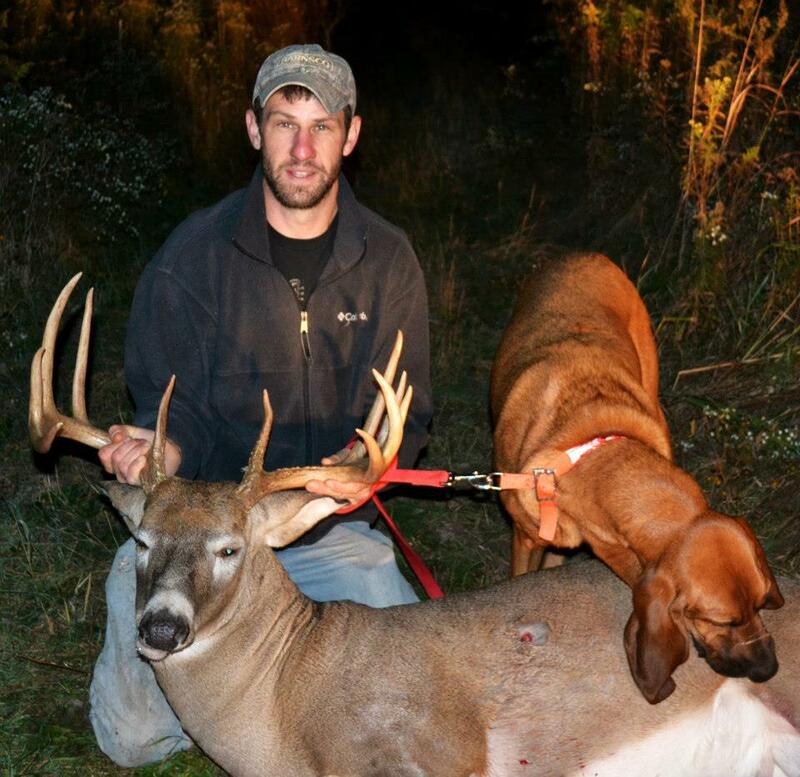 MICHIGAN DEER TRACK'N HOUNDS LLC Michigan's Professional Deer Blood Tracking Dog Services: Deer tracking dogs Grand Rapids Michigan. 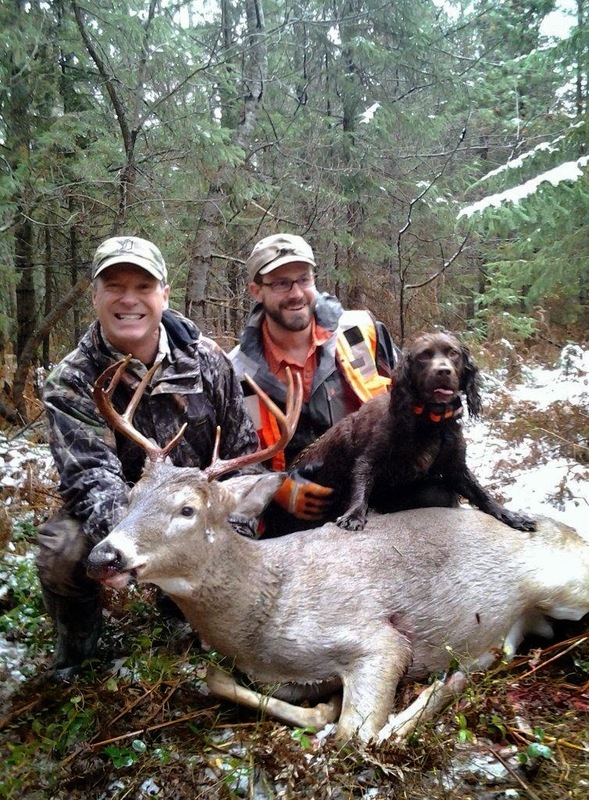 Deer tracking dogs Grand Rapids Michigan. I was in Van Buren County hunting downwind of a thick bedding area yesterday (11/10) A.M. when a couple does came crashing out. Hot on their trail was a buck with his nose to the ground. He was chasing the two does in circles in front of my stand. It all happened so fast and after I took the shot I watched the arrow fly a bit farther back than I had hoped. The deer did not seem really spooked after the shot and didn't run more than 20 yards before stopping. After an hour I got down as quietly as I could, grabbed my arrow and backed out. With just watery blood on the arrrow, I assumed the worst figuring that it was a gut shot and hoped he had not gone too far to bed down. 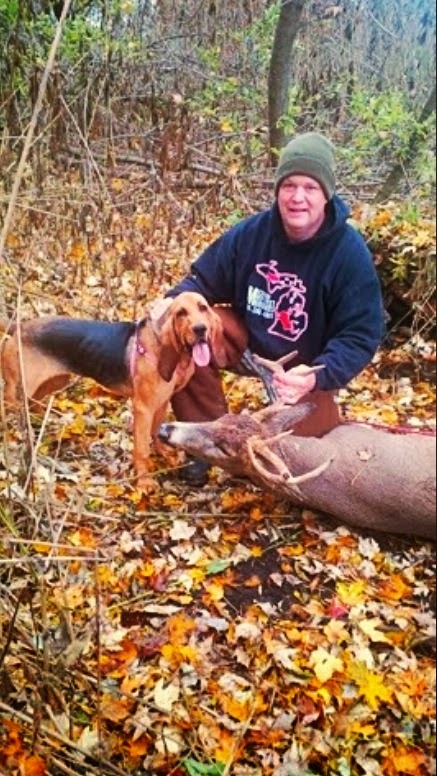 I decided to track the next morning (today) and had Brian Westra and his dog Cider meet me from Michigan Deer Tracking Hounds. To my surprise it only took 10 mintues and about 50 yards from the shot before Cider found my deer. It turns out I hit the liver and he looked to have expired relatively soon after the shot. We still processed the deer, but with highs in the 60's this weekend we ended up getting rid of almost half the meat which smelled quite questionable. 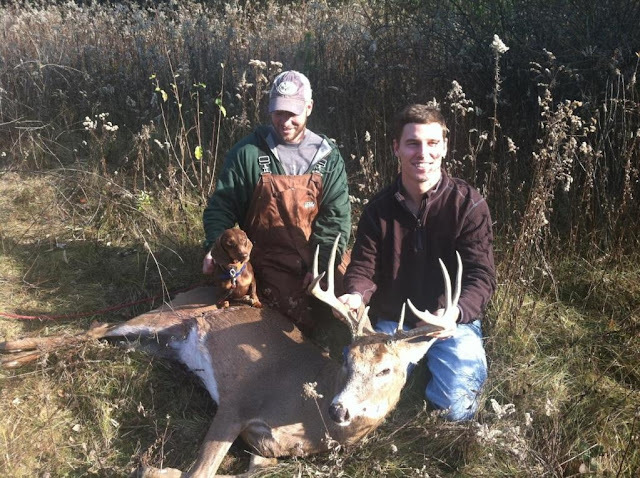 I originally thought it was a 10, but I'm quite proud of this 8 point! I have not scored him yet, but I am guessing between 110" and 115" and possibly my biggest to date.